Remember when I said in my Inka Trails Restaurant - Claremont post that Peruvian lomo saltado was amazingly like Vietnamese thit bo xao voi khoai tay chien? 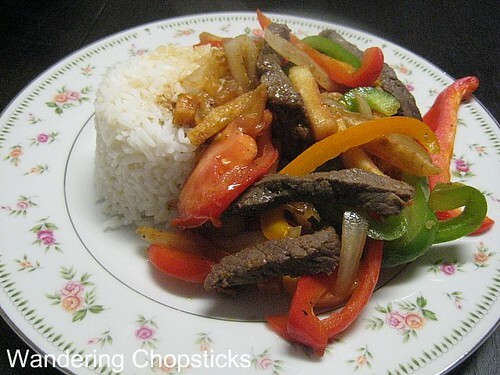 Except for the addition of bell peppers, everything else in a lomo saltado recipe is what can be found in a thit bo xao voi khoai tay chien recipe. I'm sure if colorful bell peppers were commonly found in Vietnam, they would have been added too. 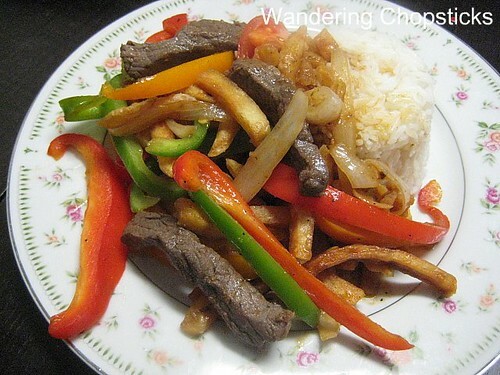 The main difference is that in lomo saltado, the meat, fries, and veggies are all cut to be relatively the same shape. Wash beef and cut off any excess fat. 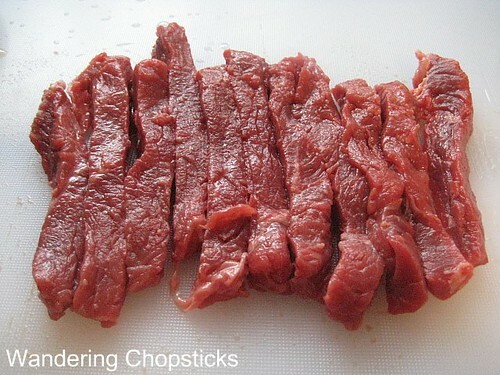 Cut into strips like shown. Add 2 tblsp soy sauce, 1/2 tsp salt, 1/2 tsp sugar, and 1/2 tsp ground black pepper. Stir to combine and set aside to marinate. 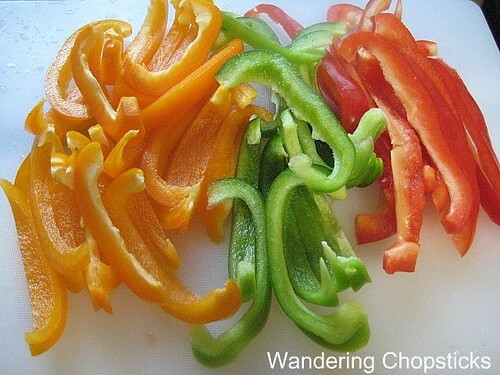 Cut 1/2 green bell pepper and 1/2 red bell pepper into strips. I added 1/2 golden bell pepper too so you can do that if you'd like. Using two whole bell peppers would be a bit too much for this recipe, so might I suggest using the other half of the bell peppers to make my recipe for Mango Chicken? 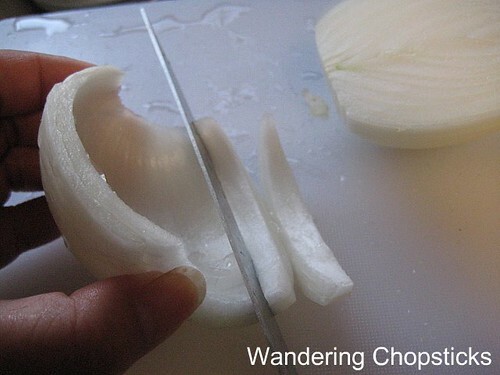 Cut half an onion into strips. Here's how I did mine. 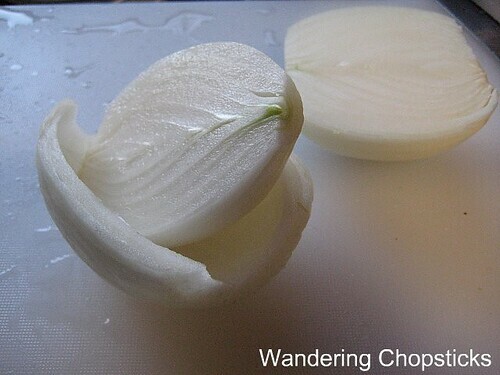 After slicing off both ends, peel out two of the layers like so. Then tilt it on end and slice into strips. 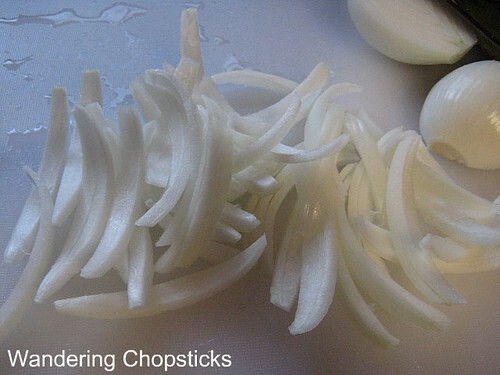 Separate and you've got a good amount of onion strips. Start frying your French fries at this point. 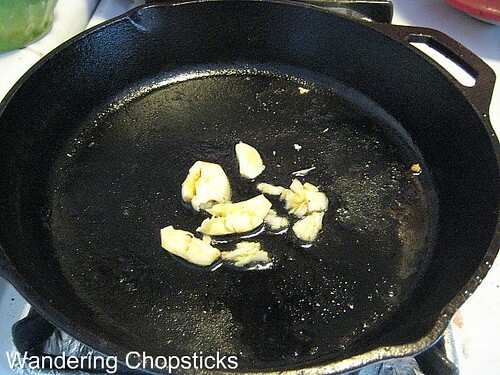 As you can see below, my French fries are frying in the wok. You'll be cooking the rest of the ingredients in stages so have everything on hand - tomatoes, beef, onions, and bell peppers. In a pan on medium-high heat, add a few drizzles of olive oil. Add 3 cloves of minced or smashed garlic and saute until slightly softened. Then add your beef, but without the marinade. Save the marinade in the bowl, it'll be used later. Lay out the strips but don't stir-fry. Let the meat develop a nice char before turning. See? Nice char. 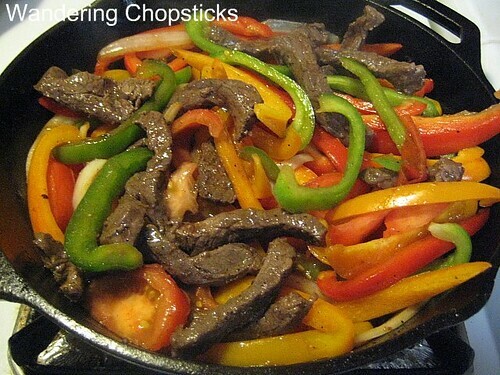 The beef doesn't have to be fully cooked as it'll be stir-fried again. So once a nice char develops on both sides, remove the meat and put it back into the empty bowl with the marinade. 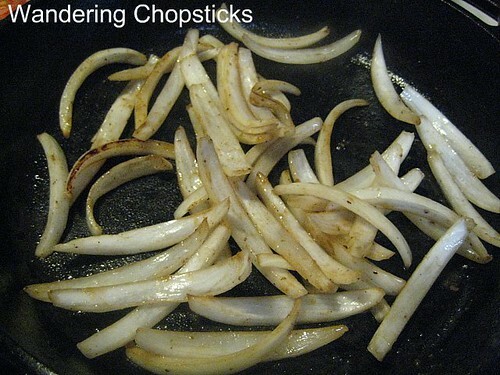 Then add in the onion strips and stir-fry until ends are slightly charred. I like adding the meat first so the onions can absorb some of the meat juices while it cooks. 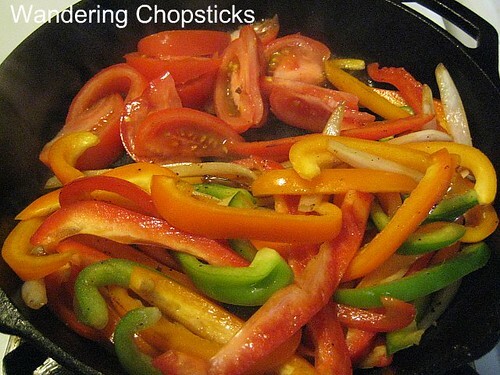 Add the bell pepper strips and lightly stir-fry again until the vegetables are tender-crisp. 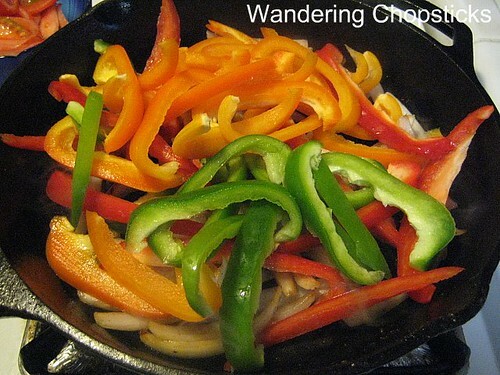 Then move the bell peppers to one side of the pan and add tomatoes to the other side. 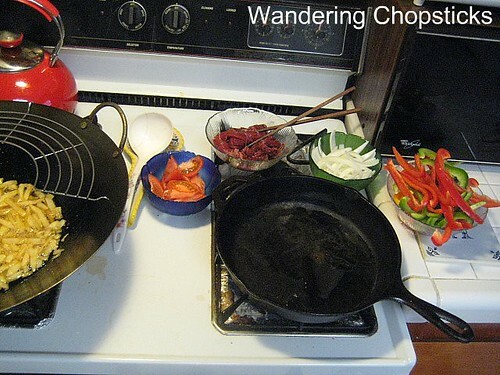 This way, you can stir-fry the tomatoes vigorously. Once the tomatoes have slightly softened and released their juices, stir-fry them all together with the onions and bell peppers. 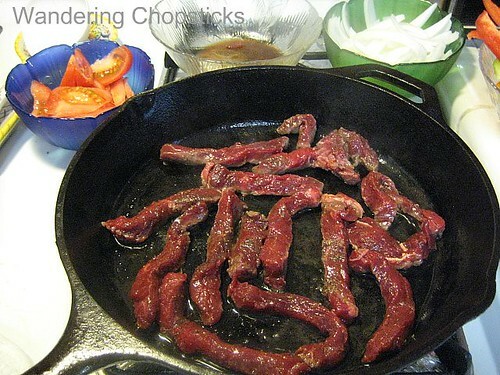 Add the beef strips along with the marinade. This way, there's still plenty of flavor from the marinade, but adding it before would have prevented the beef from browning and made everything mushy. By now, the French fries should be ready to add to the pan. You could, of course, have prepared the French fries ahead of time and set them aside. 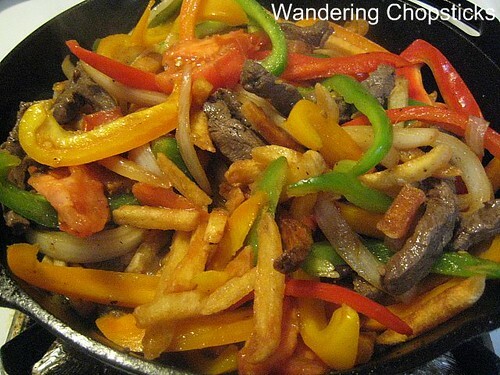 Either way, after adding the French fries, stir-fry again so they can absorb some of the beefy juices. Who else made thit bo xao voi khoai tay chien? Michelle of The Maltese Bacon followed her mother's advice and used McDonald's French fries. 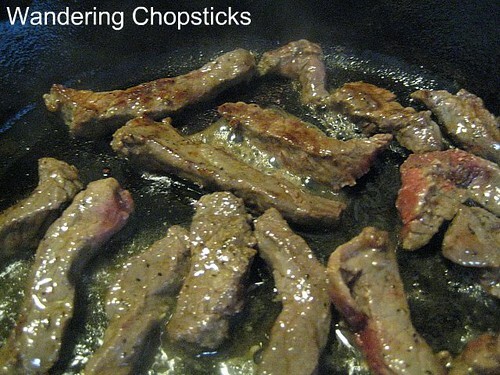 I'm submitting this recipe to Weekend Wokking, a world-wide food blogging event created by Wandering Chopsticks celebrating the multiple ways we can cook one ingredient. This month's secret ingredient is the humble POTATO. The hosts this month are Todd and Diane of White on Rice Couple. Visit their blog for the complete potato round-up with 14 potato recipes. If you'd like to participate or to see the secret ingredient, check who's hosting next month. 1 year ago today, nem nuong cuon (Vietnamese grilled pork patty rolls) and the best dipping sauce in town at Brodard Restaurant - Garden Grove (Little Saigon). 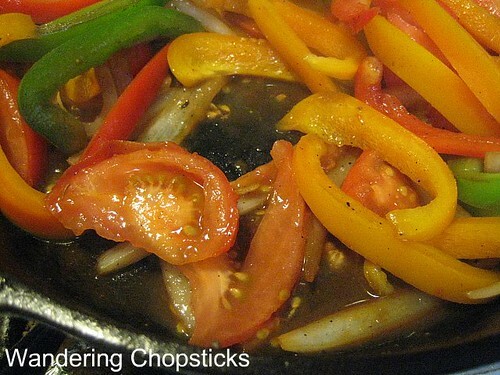 The colorful peppers certainly make the dish gorgeous! Colorful dish, WC. I make this dish quite often too. And, I also use my cast-iron skillet - it sears the meat so nicely. good method of using the overnight /leftover fries.. I use my cast iron pan a lot for searing meats. Love that char. It is a great way to use up leftover fries. This was a fun event. Thanks for starting it! I'm glad you liked it. I hope you participate in the next round. Thank you for sharing the recipe. It made our Sunday lunch very special. Lovely! I'm glad this recipe helped you have a nice lunch. A Bird in the Bush is Worth Two in the Hand? Are You a Vietnamese Blogger?